The Scottish Professional Football League is withholding £250,000 of broadcast money due to Rangers in a bid to recoup a fine imposed for the club's use of a controversial tax scheme. Lord Nimmo Smith imposed the fine in February 2013 after finding Rangers broke league rules in their use of an employee benefit trust (EBT) scheme. Rangers say they will appeal against the SPFL decision "vigorously". They argue that the company in breach of the rules is being liquidated. However, BBC Scotland has learned that Rangers' directors approached the SPFL board in the past few months to discuss payment terms relating to the fine. Nimmo Smith's commission studied the use of EBTs by Rangers Football Club plc, now in the process of being liquidated by accountancy and business advisory firm BDO, between 2000 and 2011. It found that the company's management did not take professional advice on disclosing the payments. It also determined that Rangers should not be stripped of league titles because "Rangers FC did not gain any unfair competitive advantage" nor did the payments make players ineligible. Despite Nimmo Smith's ruling, the SPFL's lawyers have examined trying to recover the £250,000 under the so-called "Five-Way Agreement" that led to the transfer of Rangers' membership of the Scottish Football Association going ahead. A condition of the transfer of the club's SFA licence was the payment of all football debts. The SPFL board have now decided to withhold payments due to the current company running Rangers, rather than chase the cash through BDO, the latter option likely to yield a smaller amount. "An appeal has been lodged with the Judicial Panel of the Scottish FA which has confirmed that the decision of the SPFL is suspended pending the outcome of the appeal subject to the SPFL's right to object." The SPFL issued a statement on Wednesday saying the fine related to "multiple breaches of SPL and Scottish FA rules". It continued: "The Rangers Football Club Limited ("Rangers Newco") signed an agreement under which they would be liable for sums such as this. "The Chairman of Rangers FC, David Somers, and on one occasion the club's then Chief Executive Graham Wallace, engaged in individual discussions with the majority of current SPFL Board members several months ago acknowledging the liability and suggesting ways of paying the sums due. "Following such discussions, it was only when no sums actually arrived from Rangers FC that the SPFL Board decided to offset this liability against future sums payable to the Club." Rangers, in a statement to the Stock Exchange, said: "The board of the SPFL has determined that Rangers Football Club Limited (the "Club") is liable to pay the EBT Commission fine of £250,000 levied on RFC 2012 PLC (previously The Rangers Football Club plc) (in liquidation). "The SPFL has also decided that this sum will be recovered from the Club by the SPFL withholding broadcasting money and other sums due to the Club but which are paid in the first instance to the SPFL. "An appeal has been lodged with the Judicial Panel of the Scottish FA which has confirmed that the decision of the SPFL is suspended pending the outcome of the appeal subject to the SPFL's right to object. "The Board is advised that the sum is not due to SPFL and the appeal will be pursued vigorously." 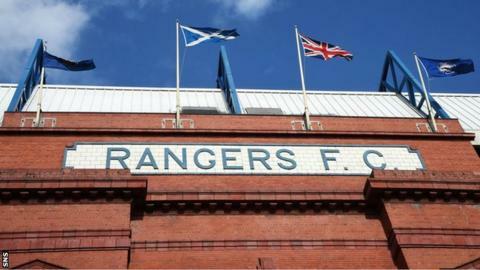 Rangers are mired in financial problems. Last month an announcement to the Stock Exchange stated "further working capital...will be needed before the end of the year". That followed a cash injection by Newcastle United owner and Rangers shareholder Mike Ashley, an arrangement that is itself the subject of a notice of complaint by the SFA. And manager Ally McCoist has tendered his resignation, triggering an increase in his salary to £750,000 per year. He is now serving his 12 months' notice at the club but will meet directors on Wednesday, with a settlement fee to leave sooner a possible result.